1 Brush the corn with a little oil and griddle, grill or barbecue for 10 minutes, turning occasionally until slightly charred all over. Allow to cool slightly. 2 Meanwhile, place the prawns in a small bowl and mix in the Cajun seasoning, 2 tsp oil and the lime zest. Heat a small frying pan and fry the prawns for 2-3 minutes until pink and cooked throughout. 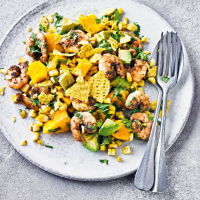 3 Cut the corn off the cobs, place in a large bowl and mix in the prawns, mango chunks, avocado and coriander. 4 Whisk the remaining oil with the lime juice and season. Toss into the salad and serve sprinkled with the broken tortilla chips.